Archangel Michael, you can participate now! Based on Meditations and thinking about this and what Michael told me in dreams I am I am releasing the full Audio of the ritual simulcast as an Mp3. Download the Audio Recording of the Ritual HERE. Need some Help in your Life? I offer a full set of services with the Angel Michael. 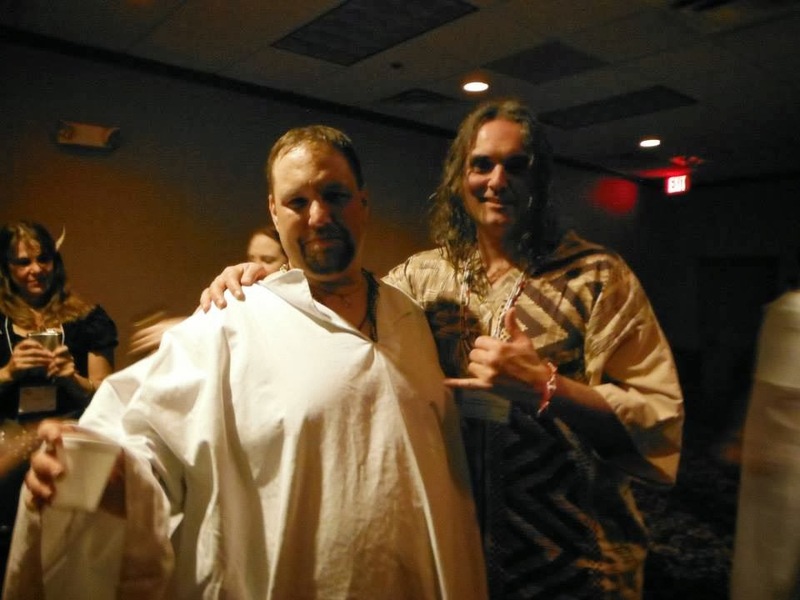 Go with someone who has the experience and a whole family of ancestors who have worked extensively with Michael to produce miracles and results. Use a magician who does a Michael Ritual, in front of 100 people with unbelievable results. You deserve to be free of your chains. Can you imagine what that would be like? A Full 7 day uncrossing and protection ritual on the point of the Archangel Michael. 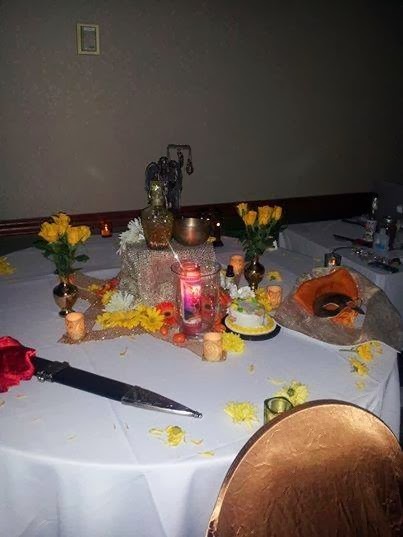 While no one can guarantee results all the time, all of my clients have had miraculous transformations after I perform the first ritual for them. The ritual effectively breaks all negative magic thrown against a person, gives them protection and strength. Get your life going in the right direction, with the strength of the angel of the Sun. Some gold highlights or ribbon. Some frankincense oil ( if you can get it). 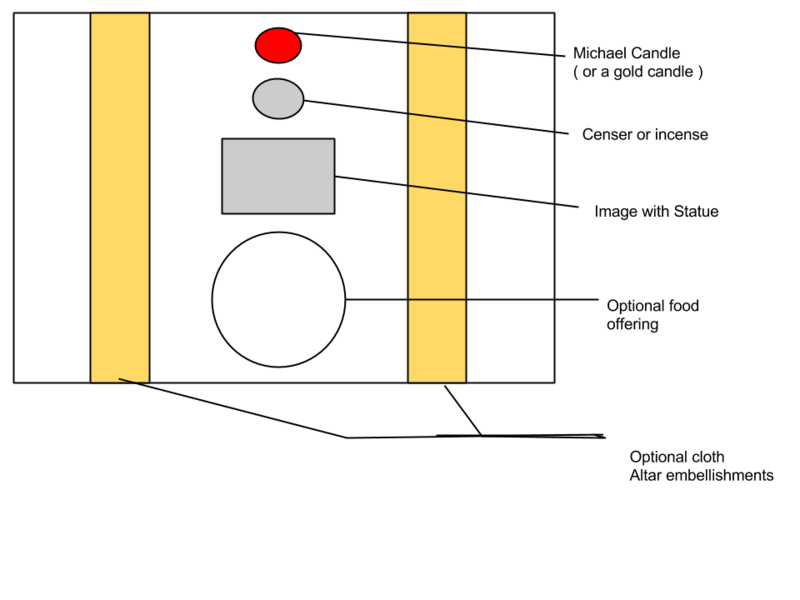 Printed picture ( from above, there are more at the end of the post). 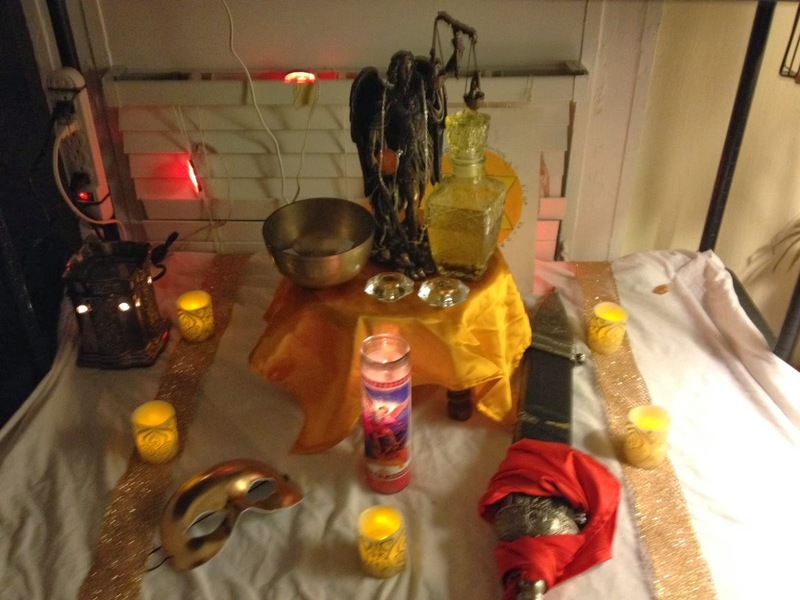 Here is a sample altar configuration. I often will embellish this kind of simple altar creation, with flowers. We are Evoking and Invoking Michael of Tiphareth which is Michael on the point of the sun. Yellow flowers are ideal. 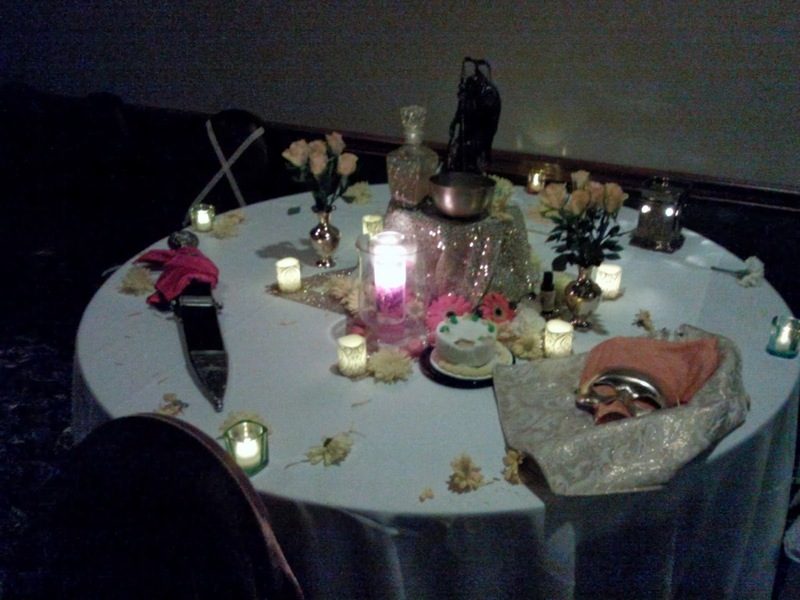 So here is what I might do to set up the altar. Wash the altar with water+ frankincense oil... you can put the frankincense in hot water and cook it, and that will make a nice water. Wash it down with either. If you got it, you could just use florida water. Lay a clean white cloth over the altar and then lay out the altar as above. I will use use the frankincense water to bless each thing I put on the altar. You can get some hebrew seals for Michael to embellish this as well. Use your creativity. Yes not everyone agrees with this configuration of Michael, but thats the way I roll. Set up everything before you listen to the recording and ready to go. Start meditating for a good half hour-hour before starting. Just try to stay in a meditative state, breathing deeply or do the Ceremony of Transformation and then relax. The beginning of the ritual is just an explanation of the ritual. The ritual starts about 30 minutes into the recording. Obviously, you not be able to receive the water blessing or the oil anointment that will happen in the ritual. 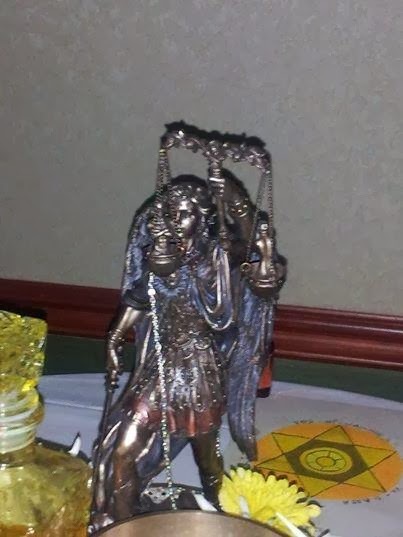 Really, once everyone starts chanting Mi-Cha-El in the asynchronous way we will explain in the audio, you should just keep time and keep chanting Mi-Cha-El while focusing on the statue picture on your altar and trying to tune in to the bigger ritual. If you are doing this at home, obviously, I can't make sure you are ok, so after the ritual stand up and laugh out loud. Afterwards, DO go and get out and have some fun. Of course, if you need help with getting into trance states, or setting up altars, check out my first book, Hands on Chaos Magic. Really, if you just breath slowly as you can and focus on the candle and picture, you should be able to get into an altered state of consciousness. At the 30 minute mark of the recording, light your Michael Ritual Candle, and put the incense on. Keep Meditating and follow along. When we get to the part where everyone is Chanting, chant Mi- Cha- El, and keep going till the end of the ritual. The ritual has the following elements so you can follow along. Description -prep-talk ( 30 minutes first). Cabalistic Cross ( just follow along). Michael Evocation purification and mounting the statue. Michael Invocation ( and by Invocation we mean INVOCATION, as in Michael merging with Andrieh for a short while). Michael Calls Judgment down on everyone and offers them his strength to release our bonds and release what holds us back from actualizing ourselves. Of course, this is a major undertaking. If you would got alot out of the recording and the ritual around the recording, please feel free to donate here. We appreciate the donations. Post Ritual, We built the altar while Michael was being called. Andrieh, I started to work with Michael after listening to your podcast and reading your page. Thank you for sharing you experience with Michael, even though I have a long way to go, Michael has helped me a lot. Andrieh, Thankyou for including the podcast on this webpage..I felt the power in it, even before I scrolled down later and saw I was supposed to create an altar. I will share it with a friend who is truly wrapped in chains, and I feel it will help him break free.